Dye-sublimation printing allows you to print photo-lab-quality pictures on your custom flag. In dye-sublimation printing, colors are not laid down as individual dots, as is done in inkjet printers. If you looked inside a dye-sublimation printer, you would see a long roll of transparent film that resembles sheets of red, blue, yellow, and gray colored cellophane stuck together end to end. Embedded in this film are solid dyes corresponding to the four basic colors used in printing: cyan, magenta, yellow and black. The print head heats up as it passes over the film, causing the dyes to vaporize and permeate the glossy surface of the paper before they return to solid form. The vaporized colors permeate the surface of the flag material, creating a gentle gradation at the edges of each pixel. And because the color infuses the paper, it is also less vulnerable to fading and distortion over time. Get a custom printed flag. Request a free quote now! Your vectored art is dye-sublimated on high-quality nylon material and then cut and edges are sewn to size. 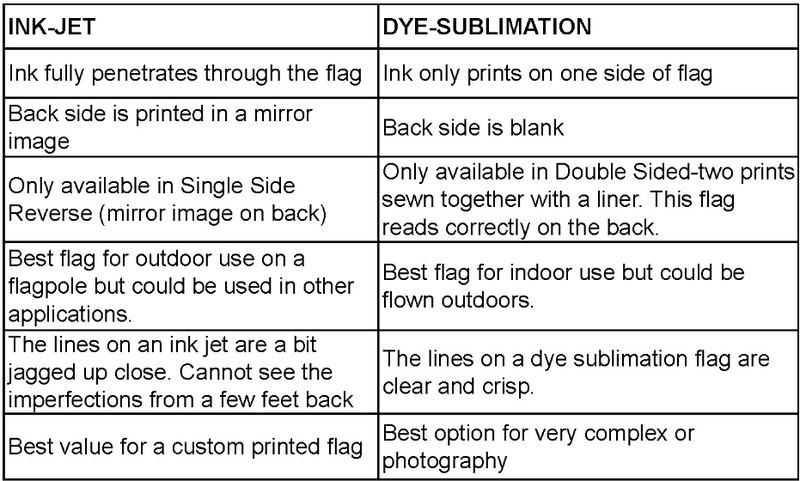 Is Dye-Sublimation right for me?